Over the years, Jerry Whitehead's artwork has gone through a number of stages. The one thing that has remained constant throughout this progression is his focus on powwows and powwow dancers. "Powwow dancers have been an ongoing theme in my work since I began painting. Seeing the dancers as a child had a lasting impression. The subject matter has been ideal for expressing a part of my culture as well as accommodating changes in my work," says the artist from the Peter Chapman First Nation. As a child in Saskatchewan, Whitehead says he was interested in art like any of his friends. He says, "I used to draw as a kid. I used to draw all the time." Unlike the average kid, he used almost any source he could find for his drawings including the ashes that remained from fires and the lead in the bullets his father used as a hunter. In his early teen years, Whitehead moved on from drawings done with pencils and lead to paintings. He believes that his interest in art comes from his family. Whitehead remembers his grandmother working with hides and says that his mother did beadwork and braided rugs. His family supported his talents and allowed him to develop them. "I was lucky to be encouraged along the way," he says. In addition to familial encouragement and an abundance of natural talent, Whitehead has sought out technical training. 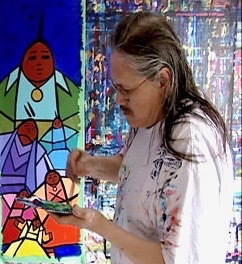 He obtained a Bachelor of Arts in Indian Art from the Saskatchewan Indian Federated College and a Bachelor of Fine Arts from the Nova Scotia College of Art and Design in Halifax. Upon completing his formal training, Whitehead began showing his work in exhibitions across the country. He has had numerous shows in Saskatchewan, Ontario, Nova Scotia and British Columbia. His work has been commissioned by University Hospital in Saskatoon and the Summer Pops Symphony at Cable Wharf in Halifax to name but two. Whitehead says that his style has changed over the years. "I went through a lot of different stages," he says. In the beginning, Whitehead did beadwork and attached the work to his paintings. He also says that, for awhile, he used to wrinkle his canvas to give his paintings a dimensional appearance. But, as in his current work, powwow dancers and powwows remained an integral theme. He currently produces abstract paintings that demonstrate his fondness of vivid colours. This, he believes, was learned from his mother and her brightly coloured, braided rugs. He says that this current style "just developed" over- time. "My work is a little tamer now," he says. "It's more refined." He attributes part of this change to development over time saying he took more risks when he first graduated from school. The other part of the change can be attributed to the fact that he is now a family man. As such, Whitehead says that he is incorporating family themes into his work on a more frequent basis. Whitehead is quick to shrug off labels for his work. He says that many people try to define his style but he refuses to limit himself in this way. He is always looking for new ways to adapt and change. "Lately I've been putting letters, words, sayings in my paintings," he says. "'Let's Dance' is about Mom in the middle, Dad and little girls; the small family ready to dance all day all night among the others. 'Let's Dance' is written in the painting." Jerry Whitehead currently resides in Vancouver, British Columbia but his work can be seen throughout western Canada. He has displays in Saskatchewan at Artworks in Saskatoon and at the Wanuskewin Heritage Park. Click to view Jerry's paintings.